Bile acids (BAs) are amphipathic molecules produced from cholesterol by the liver. Expelled from the gallbladder upon meal ingestion, BAs serve as fat solubilizers in the intestine. BAs are reabsorbed in the ileum and return via the portal vein to the liver where, together with nutrients, they provide signals to coordinate metabolic responses. BAs act on energy and metabolic homeostasis through the activation of membrane and nuclear receptors, among which the nuclear receptor farnesoid X receptor (FXR) is an important regulator of several metabolic pathways. Highly expressed in the liver and the small intestine, FXR contributes to BA effects on metabolism, inflammation and cell cycle control. 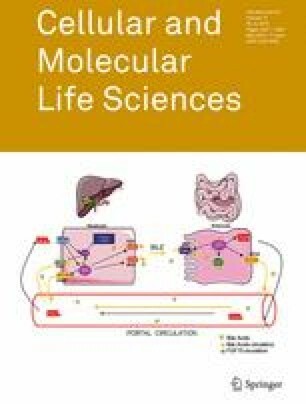 The pharmacological modulation of its activity has emerged as a potential therapeutic strategy for liver and metabolic diseases. This review highlights recent advances regarding the mechanisms by which the BA sensor FXR contributes to global signaling effects of BAs, and how FXR activity may be regulated by nutrient-sensitive signaling pathways. This review has been written on the basis of a Pubmed database search using the following keywords: “bile acids” or “FXR” to provide a detailed overview of the contribution of FXR in bile acid signaling and the regulation of FXR activity by environmental stimulus. CM was supported by a fellowship from Institut National de la Santé et de la Recherche Médicale (INSERM) and from Région Nord-Pas-de-Calais. This work was supported by grants from INSERM, Agence Nationale de la Recherche (ANR) (FXRen), EGID (ANR-10-LABX-46), Région Nord-Pas de Calais, Fond Européen de Développement Régional (FEDER) and Cost Action BM0602. B Staels is a member of the Institut Universitaire de France.